Saving stills and animations in Blender is essential to showcase your work. Since a lot of questions are asked about this I've prepared this little mini-tutorial on how to save your work. Before you can save an image you need a scene to render, so let's set up a little scene. Start Blender and add a UV Sphere. Make sure you can see the sphere in camera view. Also add a lamp, so the sphere will show up in the rendering. Before we render the image, set the size of the image with SizeX, SizeY and the percentage buttons located in the RenderButtons . Now render the image with and hide the render window with or . TIP: use the percentage buttons to quickly do low resolution test-renders while you're working. Now we need to select the filetype in which the image will be saved. Locate the filetype buttons on the right of the RenderButtons and select the filetype for your image. Note: stills can only be saved as Targa or Jpeg. Now press to save your image. A file window will open in which you can select the directory the image should be saved in. Type the name of the directory in the first and the name of your image in the second text field and press twice to save the image (the first time is to confirm the file name; the second time actually saves the file). Note: you have to include the file extension (.tga or .jpg) when you name your image! First we'll animate the sphere, so we'll have an animation to save. At frame 1 select the sphere, move it a little to the left of the camera view and insert a location key with . Advance to frame 51 (press five times). Grab the sphere again, move it to the right of the camera view and insert another location key. 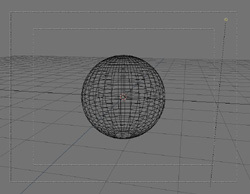 Go back to frame 1 again and press to verify the sphere is animated. Press to cancel animation mode. Before we press 'Anim' to render the animation we need to make a few preparations. Set 'Sta:' to 1 and 'End:' to 51. Set the filetype again. Set it to 'AVI Raw' or 'AVI jpg' to create an animation in a single file or select 'Targa' or 'JPEG' to save all the frames as separate images. Also make sure the button labeled 'Extensions' is set and don't forget to set the resolution (usually animations need to have a lower resolution than stills!). Note: you need the Motion Jpeg codec to view AVI jpg files. Get it from here. Paths should end with '/' (or '' if you're using windows). Anything after the last '/' is used to name the animation. Blender will also assign names to animations automatically: AVI's will be saved as 'NameStartframe_Endframe.avi', individual frames will be saved as 'NameFramenumber.tga' (or .jpg). For example: enter 'C:BlenderMyAnim' to save the animation as '0001_0051.avi' in C:BlenderMyAnim. Enter 'C:BlenderMyAnim' (without the last '') to save the animation as 'MyAnim0001_0051.avi' in C:Blender. The last thing to check is that there are no spaces in the Pics textbutton. If there are spaces Blender will generate an error: 'ERROR: Open Movie' and your animation will not be saved. Blender will also generate this error if the specified path doesn't exist. After you've entered the path and name hit 'Anim' and your animation will be saved. Well, that concludes my mini-tutorial. I hope this has cleared up any problems you might have had concerning the saving of stills and animations, but if there are any questions or comments please send an e-mail to support@blender.nl. Happy blending and now that you know how to save your work feel free to show us what you've made!